Holy Baptism is not just a naming ceremony or christening, but a serious commitment to follow Christ Jesus and live a Christian life. 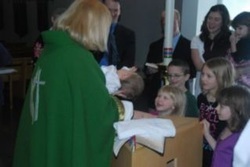 Parents who chose baptism for their children are promising to raise them in the Christian faith. Adults who consider baptism should do so over a longer period of time, after a season of spiritual exploration and formation. Episcopalians consider Holy Baptism “full initiation by water and the Holy Spirit into Christ’s Body the Church. The bond which God establishes in Holy Baptism is indissoluble.” This means once a person is baptized, at whatever age, he or she can receive communion and is considered a full member of God’s church. Baptismal candidates, or for someone too young his or her parents and godparents (if applicable), are asked to vow to renounce various forms of evil (within and without), to turn to Christ, and promise to follow and obey him. They are baptized with water, in the name of the holy Trinity. Baptism is a sacrament, an outward visible sign of God’s presence and action. Baptisms are usually reserved for the following occasions: the Easter Vigil (the Saturday before Easter), the Day of Pentecost, the Sunday after All Saints (the first Sunday in November), and the Feast of the Baptism of our Lord (early January).